While there is no Israeli law explicitly banning the manufacture and use of asbestos products, since 1997 new uses have been discouraged by regulations which severely restrict the import and processing of asbestos; the current regulatory regime has resulted in a de facto ban. According to Dr. Tamar Bar-On, Director of the Asbestos Division, Environment Ministry, the government is currently holding consultations on a new asbestos law, part of which will ban all future uses of asbestos, to replace the anachronistic situation which gives priority to occupational asbestos exposures when asbestos is no longer processed anywhere in Israel. Nowadays, the main area of concern is residual environmental contamination such as that found in the vicinity of a former asbestos-cement plant in the Western Galilee. Since the late 1960s, the Israeli Government has regulated conditions for workers at asbestos factories and permissible exposure levels within and outside of Israeli workplaces; however, the impetus to adopt effective measures to minimize exposure levels and upgrade regulations was a media furore in the early 1980s which led to the setting up of an Interministerial Committee.1 In recent years, the Ministry of Environment has stepped up its level of asbestos-regulated activities by: producing information to raise public and professional awareness of the asbestos hazard, establishing new training initiatives for asbestos contractors and inspectors, implementing a permit system for work with asbestos, increasing fines for infringements of asbestos regulations and ensuring strict procedures are obeyed for the disposal of asbestos waste. levels of illness are also elevated amongst residents of areas near asbestos-cement plants, family members of asbestos workers, former workers from the shipyards, electrical power plants, construction sector and insulation industry. From the 1950s, asbestos was widely used in Israel predominantly for asbestos-cement building products4 for roofing, wallboards, pipes and chimneys.5 Government sources estimate that industrial buildings, agricultural structures, educational institutions, parking lots, army camps6 and private buildings in Israel contain up to 100 million square meters of asbestos cement. Asbestos was also used for thermal insulation, soundproofing and friction materials, including brake linings. Overall, 90% of all imported asbestos was chrysotile; the remainder was crocidolite. 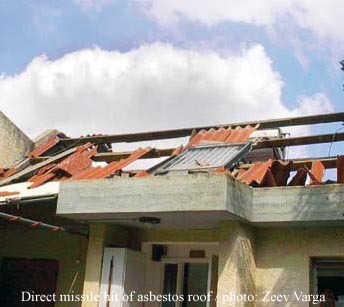 The vulnerability of asbestos-riddled infrastructure to natural and man-made disasters was illustrated during the 2006 war with Lebanon, when rockets damaged 25,000 square meters of asbestos buildings. The high concentrations of airborne asbestos combined with exposure to smoke, dusts, fumes and gasses produced a toxic cocktail that affected civilians and soldiers alike. 1 Confronting the Asbestos Problem in Israel. September 2005. 4 The asbestos-cement products were composed of up to 10% asbestos fiber. Asbestos imports peaked at 9.5 thousand tons/year in 1975-77. 6 Pical asbestos boards, used in the armed forces for several decades, contain up to 40% asbestos. A multi-million dollar army project to remove asbestos pical boards from Israel's army bases is on-going. 7 The company operating this plant was Eitanit, formerly known as Isabest; the factory was in Nahariya, in the Western Galilee, currently a hotspot of asbestos-related disease. 8 In Aug 2007, a court in Haifa dismissed a class action suit filed by a coalition of citizen's environmental groups to require the former factory owners to pay for decontamination costs; this decision will be appealed. 9 Tackling the Asbestos Problem in War and Peace.